This is a representation of Isaac Larson, first husband of Martha, and father of Louis Isaac, Eric, Isaac, and Ranard. 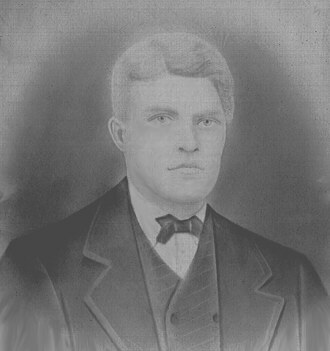 It is a drawing by an unknown artist of my great grandfather, who died of rocky mountain fever in the summer of 1886. Not long after Isaac's death, their shack home burned, and along with it presumably any records, family Bible, photos, or ? that might have existed. In 1888, Martha married Dan Tjenstrom, who had also emigrated on that same ship with them, in a group of thirty, from Sweden in the spring of 1882. Thanks to several books, including McLean County Heritage ND 1978, and two by Mary Ann Williams, entitled, Pioneer Women, and Pioneer Days of Washburn and Vicinity, we have a small and unclear picture of Martha and Isaac's brief life together. I will attempt to summarize some of the information and stories gathered from the various accounts. Martha Margaret Sjostrom, daughter of Barbro Stina Andersdotter and Eric Petter Sjostrom was born on a farm of Viksjo, Angermanland, Sweden, on April 8, 1852. Her parents were married June 21, 1849 in Viksjo. Viksjo was about forty miles north of Stockholm. She married Isaac Larson in Sweden. He is believed to have been born there in 1854, also of a farming family. Three sons were born to them in Sweden: Louis Isaac January 8, 1878; Erick in Varmland, March 2, 1880; and Isaac in Stordahn, February 18, 1882. Martha, Isaac, and their three sons left for America in early spring 1882 in a party of thirty Swedes. Although Louis Larson was little more than four years old at the time, he recalled how women and children were crowded into Swedish 2-wheeled carts while the men walked to the sea coast. Remember, Isaac was merely three or four months old at the time. There, they learned the passenger ship had already sailed. They then took passage on a half sail-half steam cattle boat, which took 27 stormy days to cross the Atlantic Ocean. Traditionally on such ships, the men were separated from their families. There were many young children in that party of Swedes. It is not surprising to read passenger list accounts to learn of deaths among the young and the old. We can only imagine their hardships on such a crossing. Names mentioned that made the trip were: family men, Nels Nelson, Eric Anderson, Olaf Oberg, Isaac Larson; others were Dan Tjenstrom, Eric Olander, A.P. Peterson, and a young girl, Mari Larson (the caregiver for the Oberg children). 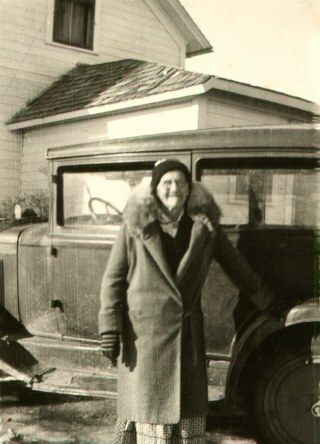 Mari or Mary would later become the mother-in-law to Louis Larson, with his marriage to her daughter, Hattie. Hattie was a daughter of John Ecklund, Sr., perhaps the earliest homesteader of Elm Point (of Lewis and Clark fame). John had changed his name from Johan Erickson (or Ericcson) to John Eklund and finally, John Ecklund, believing there were too many Ericksons already in McLean County! We have been told, the party traveled by train from New York to St. Paul and on to Bismarck. The then flooded Red River Valley had been their original destination. In Bismarck, John Satterlund convinced them that the homesteading possibilities were ideal in the area to be known as McLean County. Several men, including Jacob Wicklander, Olaf Oberg, and A.P. Peterson, bought a team of oxen along with wagon and other supplies to set out for their prospective homestead lands. After arriving in the Washburn area, they staked claims, constructed tents, and shacks. The women with families remained behind in Bismarck. They later came up the Missouri River by steamboat. According to the McLean County 1978 Heritage book, it is believed that boat may have been the U.S. Engineer's "Mandan." There are two 1912 photos of it with different views, that were contributed with the Wicklander story account. It appears to have been a front paddle steam boat. The boat landed by the Joe Barlow place where the Turtle Creek used to dump into the Missouri River. A party of Indians greeted them, apparently without incident. There was a load of lumber on that boat, which is said to have been used in the construction of a number of Washburn homes. Some of that original lumber is believed to be in the Scholl home in east Washburn.